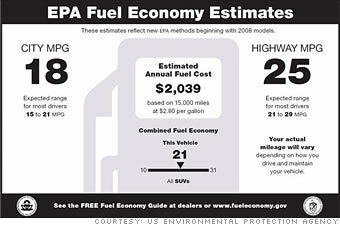 The EPA's proposed fuel economy labels range from baffling to genuinely useful. The government is asking for public comment on two proposed designs for new fuel economy labels. So here's what I think of today's label, and the two proposed designs. There are also a couple of others designed to deal with electric cars and, even more confusing, gasoline-electric plug-in hybrids. The current EPA fuel economy sticker isn't so bad, really. The information is simply and clearly represented. So what's wrong? First of all, do you drive in the city all the time? Or only on the highway? This sticker makes a big deal out of the separate city and highway figures while burying the more useful "combined" fuel economy. Besides making it harder to compare cars, it also allows automakers to do less about overall fuel economy and focus on highway fuel economy, which is relatively easy to boost and gives big numbers. Also, by focusing only on "miles per gallon," these labels make hard to really see how much fuel a car uses. What you're seeing is how far it goes on a gallon. That's not too helpful. We need labels that make it easier to understand what we really want to know: How much gas this car will use.